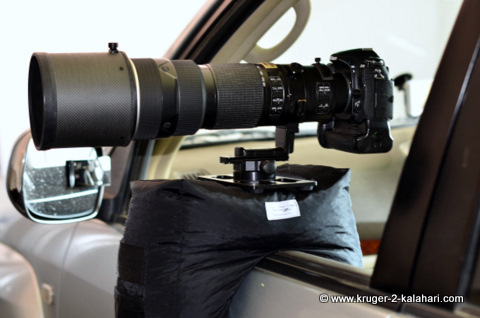 We love the ease of using a beanbag when photographing from a vehicle. 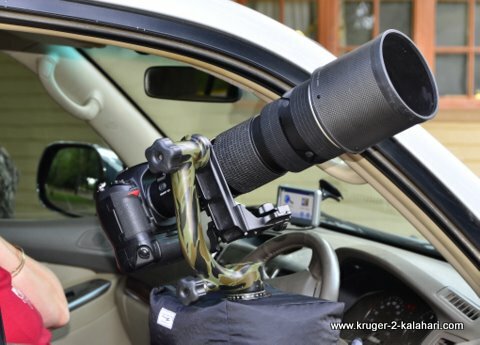 You just slap it onto the vehicle window frame and you're ready to shoot! If you are travelling on a plane you empty it out and fill it will rice, seeds or beans when you arrive at your destination - no weight issues. In our quest to find the best safari beanbag we tried most types of bean bags from the simple bank bag filled with beans to the more modern Kinesis safari sack that can be folded and has non-slip rubber on the bottom. After the Kinesis I progressed to the Badger bean bag and then to the molar bag. The molar was my best safari bean bag but it sometimes slipped forward or backwards on the window as it did not have non-slip rubber on the U-shaped part. 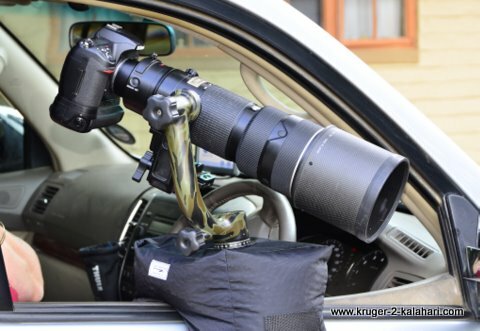 The other problem was that I could not leave my camera-lens-panning-plate setup mounted on the molar bag while driving. And a further problem was that I could not shoot long exposures as the camera and lens has to be perfectly still for up to a second or two and this was not possible with just a panning plate. Gimbal heads are a must for big lenses. They enable you to effortlessly track moving subjects but to use them in a vehicle you need a window pod / window bracket. I started with the Kirk window mount and also used the Groofwin pod, Badger and the Camstedi window mounts. The biggest plus was that I could mount my gimbal or ball heads and so leave my lens in position for long periods of time. The biggest problem was that most of these window pods simply rested on the window and were not stable when driving. I preferred the Kirk as it clamped onto the window and was therefore safer, allowing me to drive with my camera and lens mounted and ready to shoot but it still was not the ideal solution. The Kirk, however, had the problem of being designed with a 'Z' shape so the head is mounted lower that where it clamps onto the window. Some people didn't like this low position so they, like I, inserted a metal or wood block between the head and the bracket. A ballhead works fine with it but the version two Wimberly or Benro gimbal heads produced a problem - the pan locking knob sticks out and if you turn the head too far the knob may hit your window. 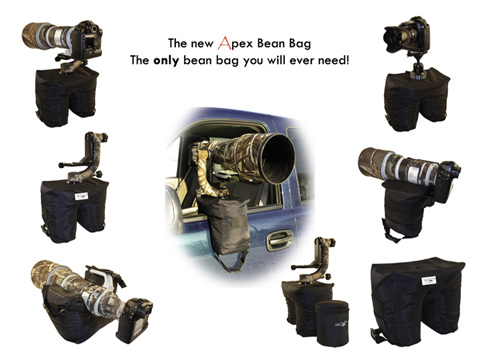 In January 2011 I saw an advert for the Apex bean bag so I ordered one and it does provide the best advantages of both bean bags and gimbal heads/window-pods. 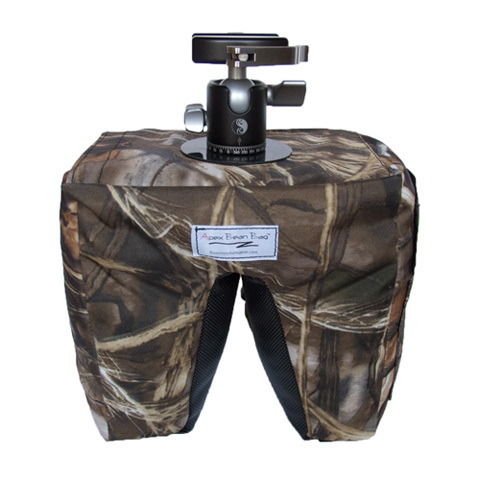 The Apex Bean Bag comes with an aluminum plate that can be inserted into the top pocket of the bag as a tripod head for you to mount your gimbal head. This is when you would need to use a Remote Cord in order to ensure sharp photographs and to not move the lens off the subject! The U shaped portion is covered in a high-tack material so no more slipping bag! The attachment loop provides a convenient place to add pouches and bags - no more fumbling for my accessories like tele-converters, flash, extra batteries and flash cards. 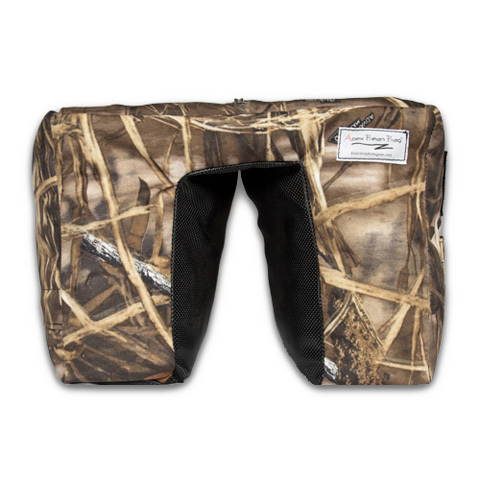 It also has a large side pocket that provides additional storage capacity for items. 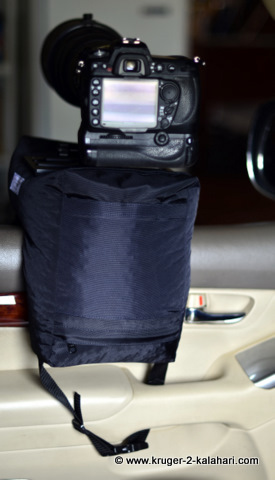 The new Apex Bean Bag solves a lot of the problems we mentioned at the beginning and I especially enjoy the fact that I can now leave my lens in position for long periods of time. The only potential issue is that when the gimbal head is mounted the camera is raised a bit higher than normal - this is good for subjects that are high (in trees, on hills etc.) but not good if you want to shoot a subject lower than you. This problem isn't unique to the Apex as the molar and badger bags have a similar issue. All I do is take the camera off the molar bag and rest it on the window frame for low shots. EP Gear, who make the Apex, realised that all vehicles have different size windows and that people are different heights so they now make the Apex in three sizes. Overall I really like the Apex and think it currently is the best safari beanbag for self-drive safaris due its three different sizes and ability to add gimbal and ball-heads. For guided safaris we would suggest using any simple beanbag as each vehicle has a different layout so you never know whether you will get high/low sides, a bar in front of you etc. 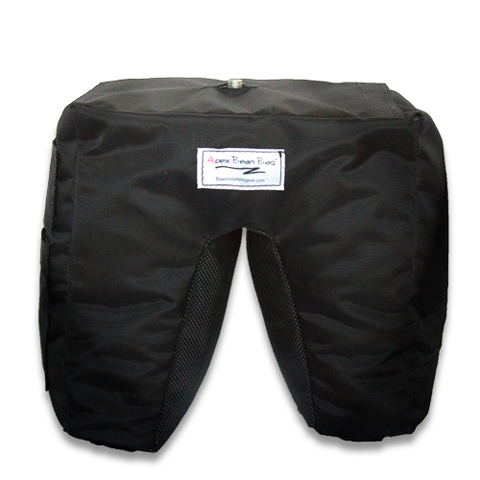 Generally we use the Badger beanbag for guided safaris but you could also use the Apex mini.